The Samsung Galaxy S8 and S8+ were meant to be a triumphant return for the Korean manufacturer after the Note 7's fiery demise. These Samsung flagships may be fine phones, but they are not without their problems, especially as they get older. This is why we've rounded up all the common issues users encounter with the Galaxy S8 and S8+, as well as their potential solutions. Users of the Samsung's Community Forum have been reporting audio issues with their Galaxy S8 and Galaxy S8+ devices. The sound / audio of their S8 or S8+ cuts off at random when they are playing music, streaming YouTube videos or playing games. As far as we understand, this issue seems to only affect the sound coming out of the speakers, not headphone audio. Users are speculating that the audio issues are due to loose wiring, a theory backed up by the fact that if you apply some pressure just above the speakers, the audio comes back on. Apparently, if you violently shake the S8 (don't! ), it also reproduces the same problem. If this is true, then it would definitely point to a hardware issue—meaning a simple software update won't fix the audio issue on the Galaxy S8. So is there a solution to fix the Galaxy S8 audio issues? 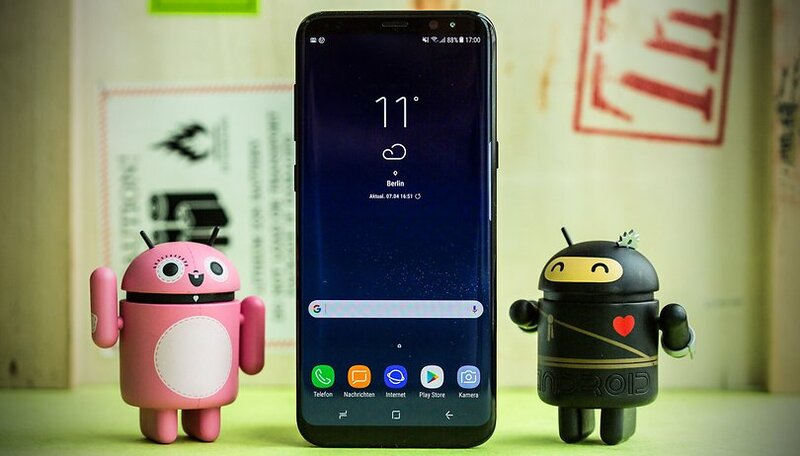 Samsung has responded to some users that it could be an app or software causing the issues and recommended to put the devices in safe mode for 1-2 hours and monitor the audio usage. This apparently did not fix the problem though. Enable the developer options on your Galaxy S8 if you haven't already done so. Go into the Developer Options scroll down to Media and toggle Prevent USB audio routing on. This apparently solved the audio issue on the Galaxy S7 and might prove to work for the S8 and S8+ as well. Why does my Samsung Galaxy S8/S8+ restart by itself? A number of users on the Samsung Community forum reported that their Galaxy S8 and S8+ devices continuously restart. One quick fix is to do a factory reset, but the problem appears to resurface after a few hours. A few users have reportedly tried rebooting to resolve this issue, but discovered that after this their phones will not turn back on again at all. There hasn't been any official comment from the company on this Galaxy S8 problem, but the indicators are that this could be related to the microSD card. Some users have reported seeing a “Transfer files to SD card” notification after restarting the phone, whereas others have said they are experiencing even more problems after they transferred or removed all the apps from the card. Samsung has reportedly advised any affected customers to send in their devices for repair, or exchange for a full refund. That said, to date, there has been no official statement from the company on this issue. This is a problem that they will ultimately need to respond to, as this is a significant fault: constant restarting on any smartphone will eventually make the device completely unusable. Hopefully, all that will be needed is a software update to resolve this fault. However, in the absence of any word from Samsung it might be time for us to prepare for the worst. One of the major selling points for both the Galaxy S8 and S8+ is their super AMOLED displays, which gives both devices very accurate color representations. It was also here that Samsung had its first reported Galaxy S8 and S8+ problems, as numerous users complained about display "bleeding", resulting in discolored, red-tinted screens. According to one Reddit user, this issue is nothing more than a limitation with Samsung’s OLED panels. To get even more technical, this is the result of Samsung's use of low-temperature polycrystalline silicon instead of a material like indium gallium zinc oxide. Samsung has already responded to this issue by distributing a software update, which regulates the color balance of the device. The company says it is simply offering "a further enhanced ability to adjust the color setting to their preference," so once you receive the update you can adjust the display even more than when you first took it out of the box. Whether or not this actually goes some way to resolving the issue remains to be seen. Quite a few Galaxy S8 owners have voiced complaints that their home button seems to be malfunctioning. After locking the phone it begins to vibrate and turns the screen back on, prompting a password unlock (either passcode or fingerprint scan). Apparently, this issue occurs both immediately after locking the phone, as well as after a delay of a few seconds. Go to App > Settings > Navigation bar. Locate Home button sensitivity and drag the slider to the desired place. The Galaxy S8 doesn't have a physical home button anymore, so it could very well be something that's fixed by a simple software update. It's worth noting that at present the home button issue seems to only be occurring on Galaxy S8 devices. Quite a few users have been reporting that the Wi-Fi connection of the Galaxy S8 keeps dropping. It had been suggested to try out different Wi-Fi frequencies, but the problem persisted with both 2.4 GHz and 5 GHz. Wi-Fi signals disconnecting and reconnecting were also an issue reported by Galaxy S7 users, many of whom had suggested clearing the cache (some even recommended a hard reset). This worked for some users, but not all. The Wi-Fi issue has been acknowledged by Samsung / various carries, and a patch should have already arrived to your device in the form of a software update. If you own an unlocked Samsung Galaxy S8, you should have received the patch directly from Samsung. Otherwise, you'll have to wait for your carrier to push it out. Apparently, multiple Galaxy S8 and Galaxy S8+ users are having issues with their Bluetooth connection. When the device is connected to Bluetooth speakers and headsets, the audio can break up. Other users are reporting that when they are listening to music via Bluetooth speakers, the Bluetooth connection just disconnects. Tap on it. You will see when the latest update has been installed. If you think you still haven't received it, tap on Download and install - the phone will check if your software is up to date. Samsung Galaxy S8 fingerprint scanner not sensing finger? The Galaxy S8 fingerprint scanner seems to be causing several issues. The main problem seems to be that the fingerprint scanner can't or won't always recognize notification gestures or fingerprints. Some users report that the fingerprint sensor is basically dead, refusing to recognize multiple saved fingerprints to unlock the Galaxy S8. A temporary fix to this seems to be performing a simple reboot, though it's been reported that the issue comes up again. Users in the Samsung forum have stated that they spoke to Samsung support who said this was software, rather than a hardware issue which should be fixed in an update. Samsung Galaxy S8 face detection not working? Both Galaxy S8 and S8+ users have reported that after receiving an update in late April, the face detection has stopped working. Regardless of how often a face is registered, the face detection refuses to work. The usual recommendations were tested - clearing cache, rebooting, and making sure that all apps are up to date. However, none of them had fixed this Galaxy S8 issue. Samsung hasn't made any statements regarding the broken face detection, but it clearly seems to be a software problem. Samsung Galaxy S8 Edge Lighting not working? There seem to be various issues surrounding the Edge Lighting not working. In theory, Edge Lightning should light up the edge of the screen when a message or call is received. You should also be able to color code up to five contacts. Some users have reported that the edge lightning doesn't work with any app or call, and that it's not possible to assign colors to contacts. While many seem to think that this might have been a single carrier issue, users across the carrier spectrum have corroborated similar issues. It seems like there could also be an issue that edge lightning only works with the Samsung Messaging app and not the one that your carrier provides—though this is still unconfirmed. Then tap and hold down on Edge Lighting (make sure that it's set to Always on) and then tap on Manage notifications. The notifications are turned off by default so you will need to turn them on individually. Another issue that users have reported is that Edge Lighting works when the display is turned on, but refuses to work when it's turned off. Another possible solution here is to simply switch off the Keep screen turned off in the display settings. To do this go into the Settings > Display and then scroll down to "Keep screen turned off" and toggle it off. This doesn't seem to fix the issue for everyone one and, according to the Samsung forum, the company is currently looking into this issue. A useful reminder is that for the Edge Lighting feature to work, your phone needs to be laying face down on the surface. Samsung Pay apparently has a bug which causes it to freeze up your phone. This issue seems to mostly occur when you try to "swipe to unlock" the display, and Samsung Pay then attempts to show your "preferred card". This then causes the phone to freeze up between both actions. You are either then forced to wait until the phone figures out what it wants to do, or to soft reset it. Uninstalling and reinstalling Samsung Pay doesn't fix this issue. The root of the problem seems to be that Samsung Pay incorrectly registers the swipe to unlock gesture, which then causes the mix-up. Several users in the Samsung forum reported that removing/not having the favorite card selected seems to fix the issues, though it limited the usefulness of the Samsung Pay app. Go into Settings > Lock screen and Security and then tap on the Always on display. You'll need to select the clock format that you want, which then brings you into a new menu where you can change the clock style, color and background. Tap on Background and make sure to select None. This should enable the infinity wallpaper to work on all your display settings. Several users have tried downloading the My Knox app on the Galaxy S8 only to receive the message that the app isn't compatible with their phone. The answer to this dilemma is that as of 2017, My Knox won't be compatible with Samsung Galaxy phones and will be replaced with Secure Folder. Here's how to back up your My Knox data and continue using Secure Folder. Both Samsung Galaxy S8 and S8+ users have reported that they are encountering instances that when they are attempting to wirelessly charge, all they get is a blinking "charging paused". Users are also complaining that docks and pads which they bought in combination with their Galaxy S6 and S7 devices don't work for the Galaxy S8. While the cable itself doesn't seem to make any difference for the pad, it seems like the power brick (the thing that goes into the electrical outlet) seems to be the culprit. Users in Samsung forum have explained which combinations worked for them, and it seems like there's no clear pattern—just the fact that some power bricks will power wireless charging pads and fast charge in Samsung docking stations and others won't. The only real solution at this time seems to be that you should only use wireless charging pads and docks that are explicitly marketed for the Galaxy S8. "The iris sensor is not responding. Try again later"
Multiple reports have surfaced up in various forums that the iris sensor of both the Galaxy S8 and Galaxy S8+ is throwing up an error. It seems to crop up most frequently when trying to unlock the phone, using Samsung Pay or Secure Folder. In those instances, it produces the error message "The iris sensor is not responding. Try again later". Samsung is aware of the issue, but no patch or fix has surfaced yet. Users report that restarting seems to be the only solution to temporarily fix this issue, though the problem will resurface hour later again. Go to Settings > Apps > Messages > Notifications and then make sure that this is set to Allowed. None of the other notification settings work if this isn't set properly. If this does not fix the issue, make sure to backup your data and perform a hard reset. If your phone has been in contact with liquids, leave it in a bowl of uncooked rice overnight and then gently clean the port with a Q-tip. Turn off the phone by long-pressing the Power button, then tapping Power off. While the device is off, plug it into the charger and turn the phone back on. Make sure you are using the official Samsung Galaxy S8 or S8 + charger and USB cable. Your phone should now be charging and displaying time remaining to full charge. The 'Moisture in charging port' notification should also disappear. If the message still appears after taking these steps, your last resort is performing a factory reset. If that doesn't help, it might be time to take your Galaxy S8 to a certified repair shop. Have you been experiencing issues with your Samsung Galaxy S8 or S8+? Have you been able to find an effective way of resolving them? Let us know in the comments below. It is very detailed. I got solution of fingerprint not working case. My phone notifications bar shows it is on-call when I have neither initiated nor accepted any! I am unable to go to that call to identify who is on the line, if any, or speak to them! I tried restarting the phone and the icon went away for short time then came back again. I use to be able to have separate ring tones for my notifications and text messages but now the notification tone is for everything. When I go to setting to try and get a different tone for the 2 and than give different tones for different people on messages there is not an option any of that. I want this ability back. I am tired of missing messages because I think it is an app notification or I am checking my phone constantly to make sure it is not an important message from work. When I first got an S8 phone I could do all of this than there was an "update" and it no longer works. I have gone into 2 different stores thinking I was doing something wrong and they could not fix it either. Have you found resolve for this issue? This is a major annoyance to me. Just as you stated, I can no longer discern who is attempting contact because I can no longer set separate notification sounds. I'd like to know how to turn vibration off COMPLETELY, as if vibration didn't exist. Whether or not my sound is turned on. I can't seem to do it on my S8plus. I've gone through the settings, I've tried going into the apps themselves and it STILL vibrates! It's hard to sleep when this phone keeps buzzing all the time. I'd shut it off except I need to be able to answer certain calls. I absolutely HAVE TO put the phone on a cushion or something to deaden the vibration sound. Any other phone I've ever owned, I've been able to disable the vibration completely. Not this one. Ugh! Why don't you write about the Galaxy S8 Active for T-Mobile I have one and there's no info out there . What gives androidpit is is supposed to be about gadget info and there's nothing about this device. Why? So this is my second S8 since May of 2017 that I have had that is experiencing issues with no longer having my S8 sound when I receive a text message. My phone is not on silent unless I am sleeping. I've deleted all of my messages and set a limit on them to delete after 200. My first S8 started doing this after roughly 4 months of having it. It was under warranty so they replaced it for me. Now once again, only having this phone since December I am experience the exact same issues starting today. I've done all the trouble shooting and nothing works. So sick of this honestly. Anyone else have issues with this? I have an international model Samsung S8 and I need a complete screen change. I currently live in the US and am having much more trouble getting this fixed than I can explain in a comment section. Do you by any chance where I can get an international phone fixed properly? I've already checked and Best Buy and Samsung US won't do it. They're saying that I need to send my phone back to its place of origin to be fixed and that country won't even mail it back to me if I did. Wow, look at the 1st posters on here that are complaining, you sure you are not crapple users just causing crap against android? I have a Galaxy S8+ and 3 days ago it started to switch from sound notification to vibrate on its own. No matter how many times I turn it back to sound, it automatically switches to vibrate. I do not have a case on it, so that's not pushing the button. Its just laying on my desk without even touching it, it will switch. Very frustrating because I miss calls & texts. Any idea how to fix this? I have a Galaxy S8+ Phone. In the 3 months I have had it, a few issues have arisen. The power button was not functioning properly, sent back for repair and fixed. While being repaired I was using my old phone and realised how poor the call quality on the s8+ is. There is constant hissing in the background during a call, and the other persons voice is always a bit distorted, sometimes it is worse than others, to the extent that I have to ask the other person to repeat what they have said. Phone was sent back again, and when returned the problem was still there. Phone is currently away again. I tried another s8+ that a salesman had, it was the same. If it comes back the same I will tell the supplier to take it back, and get a different model that works properly as a phone. This phone is a poor performer in terms of in call clarity, and i would not recommend it to anyone on that basis. ...... but if you are interested in a toy with a flash screen and all the gimmicks then go for it !! My S8 has been returned 2 times for repair in 6 weeks. It just quits on calls. Goes totally silent. At first could use speaker but after 1st repair I couldn't even maintain a call. After 36 hrs it dropped calls 5 times in 2 minutes. Have done all recommended procedures but nothing works to remedy situation. Will have back tomorrow after second repair. They replaced earpiece and speaker 1st time. Wonder what they did this time? Did same thing in safe mode. Verizon phone bought at Best Buy. I can't get my Samsung Galaxy 8 to update. Every time I try it says "sorry, we are having trouble authenticating your device. Please try again later. A little Help please? I don't have an "audio" issue. My phone will simply just pause while any media is playing. Be it music, video, youtube, or anything else. It gets frustrating when you're working out and having to stop because your phone paused your music. One last point, the Samsung Cloud Sync. It has synced and so I found out, removed hundreds of photos and videos to the Samsung cloud even though they are displayed in Gallery. They are not physically on the phone and my attempts to download them to my phone then transfer them to a SD card are blocked. I have not yet found out how to get these photos back physically onto my phone to enable me to back them up. Switching off the Cloud Sync blocks my access to the images totally. I cannot find how to access these online either to be able to download them and keep them in my own backup system. Upgraded to the Galaxy S8 but extremely frustrated with it. The predictive text, especially using the swyping feature has been getting steadily worse since the S2 and Note4 where it was 90% perfect. The S6 used to come up with strange words on Swyping the keyboard but if you manually entered the word in using the keyboard it would accept and learn it. Now with the S8 it is driving me crazy as it often ignores what you manually type in and replaces it with very strange alternatives at random and more often than not you cannot remove these suggested option as you did previously. When using swyping feature it is even more irritating as it enters multiple words when you were swyping something simple like "and" is replaced with "as BF.". There are numerous times it replaces words with a "suggested word (space) then V8" even though your fingers were nowhere near these letters. I love my S8+ but for the last 2 days on the right side of the edge I cannot get it to work easily. I have to touch multiple times... at times 10 plus. Can i please get some kind of idea of what to do?